With our modern and wasteful way of living it may be hard to imagine that the imperfection of something that is broken can add both value and beauty to our existence. However, in the ancient Japanese handicraft of kintsugi (金継ぎ), broken ceramics are respected, healed and highlighted with gold or silver, adding yet another chapter to their history. – “Many cups become broken in two, but the material and the feeling of each of them is always different. I really enjoy the puzzle of fitting shattered parts together. 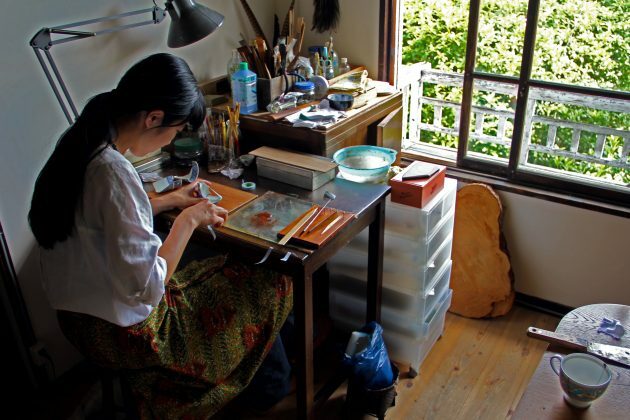 It is a very special feeling, almost like the care and tenderness you give to your child,” says the internationally-acclaimed kintsugi artist and urushi master Mio Heki, whilst sorting out her wooden tools, preparing for a new day at her picturesque studio. It was not until Heki graduated from university with a degree in arts that she fell in love with urushi. For many years she repaired traditional temple treasures, everything from big buildings to tiny objects, a job she found to be very educational. Just by cleaning, peeling off layers and preparing objects for restoration she learnt what techniques people before her had used. All the temple restoration jobs required an abundance of lacquer work, allowing her to really get to know the material. Throughout the world the tall lacquer tree, Toxicodendron vernicifluum, is known by many names. In Japan the word urushi (漆) is used both for the lacquer tree itself and for the milky white sap it produces. One tree yields only about 200 grams of urushi during its whole lifespan. Most people are highly sensitive to the material in its raw state, and skin contact usually results in grave eczema. The humidity in Japan makes a perfect environment for urushi-based lacquer which both dries and hardens by absorbing moisture from the air, needing about 70 % humidity and a temperature around 20-24 degrees Celsius. When used as glue, it takes about two weeks for urushi to dry. Depending on the mix of the urushi base, Heki usually stores the objects that she is working on in a muro (室), a wooden cabinet inherited from her aunt. This way she can control and maintain the required environment, keeping it damp by spraying water into the cupboard. – “Timing is very important in kintsugi handicraft. I’m very focused when I’m working. Sometimes I can really connect to the piece that I’m repairing. It‘s like I’m having a conversation with the object through which I get to know both the owner and the piece. It makes me truly happy that I can help create new life stories through my handicraft,” she says, leaning in over a broken cup, her long hair falling forward to enclose the broken pieces in front of her. Familiar fragrances surround Heki’s work table, a mixture of sweet scents and sharp odours. With trained hands and swift movements Heki mixes urushi and soil, kneading the paste on a glass tablet using a wooden spatula. The soil is collected from the Yamashina area in Kyoto and later ground into a fine powder. Using local soil is traditional amongst kintsugi artists in Kyoto, where the ground is known to be so rich that it serves as a raw material for abrasive powder, attracting craftspeople from all over Japan. Heki then uses the well-worked paste as a base to fill the holes and fractures of damaged pieces. As a craftsperson, Heki only uses natural components. She has made all of her wooden spatulas herself, not because toolmaking is almost an extinct profession these days, but because she truly enjoys customizing her own tools and making the most of what material she has. If one of her spatulas breaks she always tries to make a new one using what is left, which means that there are spatulas in all sizes neatly organized in her own handmade toolstands. With profound knowledge she explains the difference between their quality and uses. The ones made out of Japanese cypress are more flexible than the more solid bamboo spatulas used when repairing bigger objects. Heki believes that all traditional creations have to work very closely together with nature to be able to find their true soul. The art of kintsugi is not only assembling pieces of a broken history but also weaves together several Japanese philosophies, all enhancing the unique value of imperfection. Kintsugi holds the Japanese feeling of mottainai (勿体無い), an expression that is directly connected to the Buddhist concept of remorse over wasted and misused resources. And there are strong elements of the aesthetic mindset of wabi-sabi—a philosophy that is at peace with the natural progression of life, by accepting the beauty of change and impermanent. – “Most kintsugi artists don’t want to work with broken glass. It‘s a difficult material to repair. The surface of glass is more sensitive than ceramics which makes it harder both to polish and to assemble. But I like the challenge. I only use pure lacquer as glue when putting glass pieces together, never any colour or rice cake powder because it makes the paste thicker and therefore more demanding to work with,” says Heki, pointing at a what seems to be a hopeless pile of glass splinters, something that used to be flower vase, bought originally by a client at a marketplace in Bulgaria. Rich daylight pours in through a wide window, overlooking what is said by many to be one of Kyoto’s most beautiful sakura trees. Heki’s studio is a delight for all senses, elegantly decorated with old wooden furniture. For about a century many creative souls have lived and worked within the robust walls of this huge white house, hidden behind a massive hedge in the northeast part of the city. Both the famous film director Nagisa Ōshima and the popular painter Yumeji Takehisa have walked its narrow corridors, leaving imprints of dazzling creativity. Heki’s heart is filled with respect towards old crafts and techniques, and she works dedicatedly at her studio almost every day, all year around. 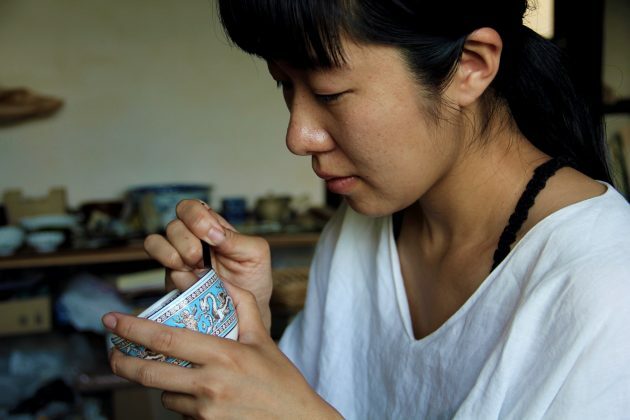 – “It is not easy to be a full time artist but I find the craftsmanship of kintsugi too interesting to let it go and it is also crucial to keep our traditional handicrafts alive. Today, a lot of people don’t even know what urushi is. Japanese people easily forget about our precious culture and the younger generations are not interested in preserving ancient crafts. Therefore I find it important to share my knowledge and thoughts. I arrange workshops both at my studio and at my house and every now and then I teach kintsugi classes in Europe. By helping to spread the word to the rest of the world, the information might travel back to Japan and catch people’s interest again,” she laughs. Legend has it that the traditional technique of kintsugi handicraft was developed around the 15th century as a way to please the shogun Ashikaga Yoshimasa, after he had broken his favorite tea bowl. Yoshimasa sent the bowl all the way to China but was not very pleased with the result when he got it back, all stitched up with metal staples. Japanese craftsmen then tried to find a more aesthetic method to repair the cup. By stuffing the cracks with gold they transformed it into a piece of treasure. Kintsugi literally translates as golden (“kin”) repair (“tsugi”). 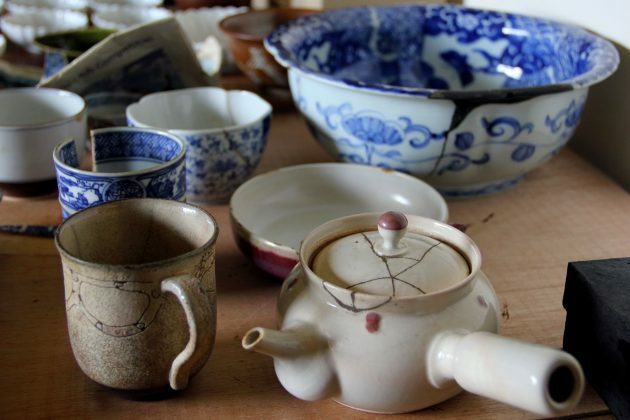 – “You could say that the art of kintsugi has evolved alongside the tea ceremony culture in Japan. 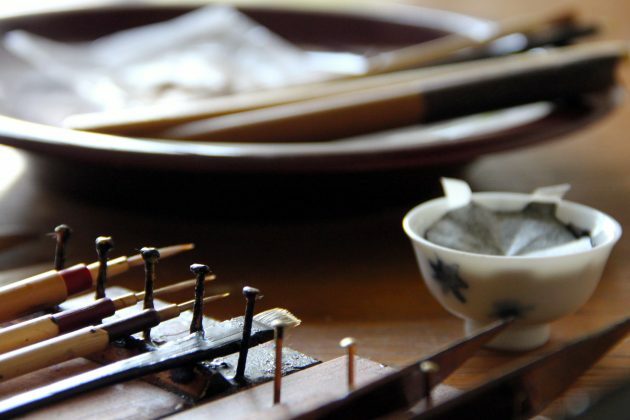 In that era everyone embraced the tea ceremony and the people in power saw the tea ceremony as an occasion to gather and a platform to talk about politics. It wasn’t unusual that leaders at the time would give away a special tea bowl as an honourable gesture, instead of giving away a castle or some land. A teacup was valued just as highly, so naturally people wanted to repair their gift if it got broken. 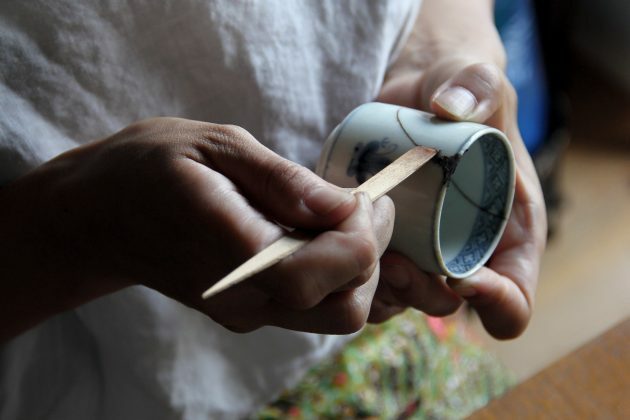 Heki not only knows how to repair a broken tea bowl in the most beautiful way, she has also mastered the way of serving tea, holding a sado tea ceremony licence. But her artistic creativity does not stop there. 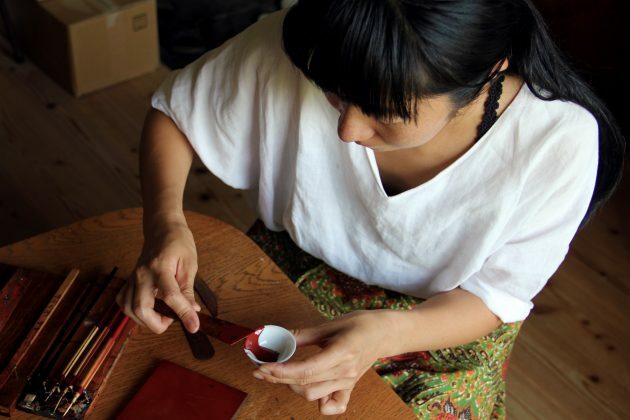 In her spare time, Heki uses her urushi skills to design both ornaments and costumes used in various stage performances, and on top of that she keeps herself busy with her own jewelry brand. Inspired by nature Heki forms her jewelry items from silver, stones or great green turban shells, combining several traditional urushi techniques like kintsugi and makie. 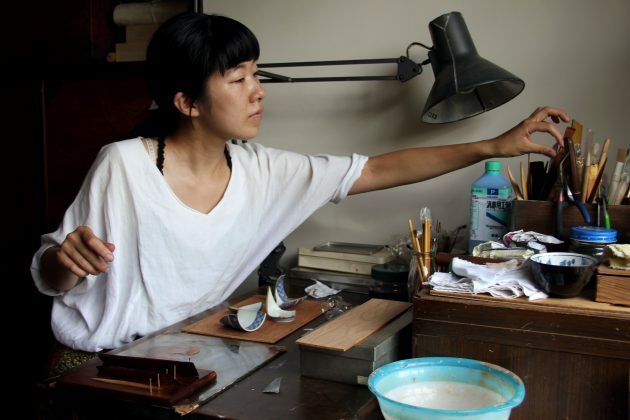 She decorates her gems using thin layers of shaded urushi lacquer, egg shells and gold dust. Photographer Yen Nie Yong will be visiting Mio over several sessions to document the process of repairing a guinomi (saké cup) by Hanako Nakazato that was dropped and shattered by our director, Lucinda, during KJ’s Tsutaya exhibit last year — unintentionally, she adds. 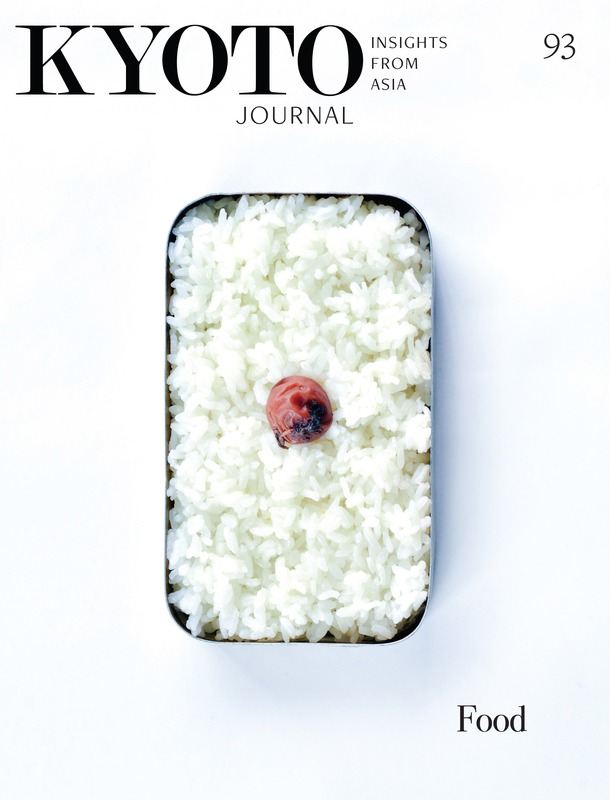 Follow us on Instagram @kyotojournal to see the whole process! working on a children’s book.